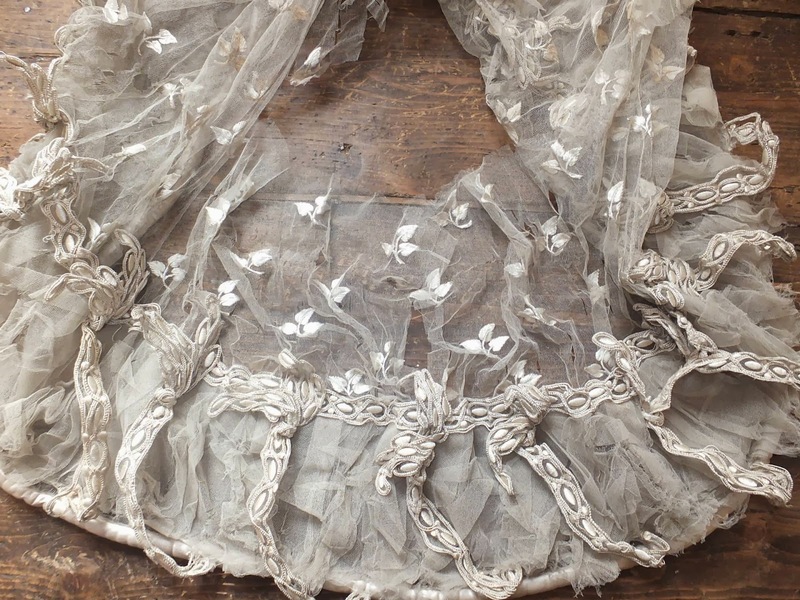 This wonderful and tragic Regency evening gown will never again be worn. 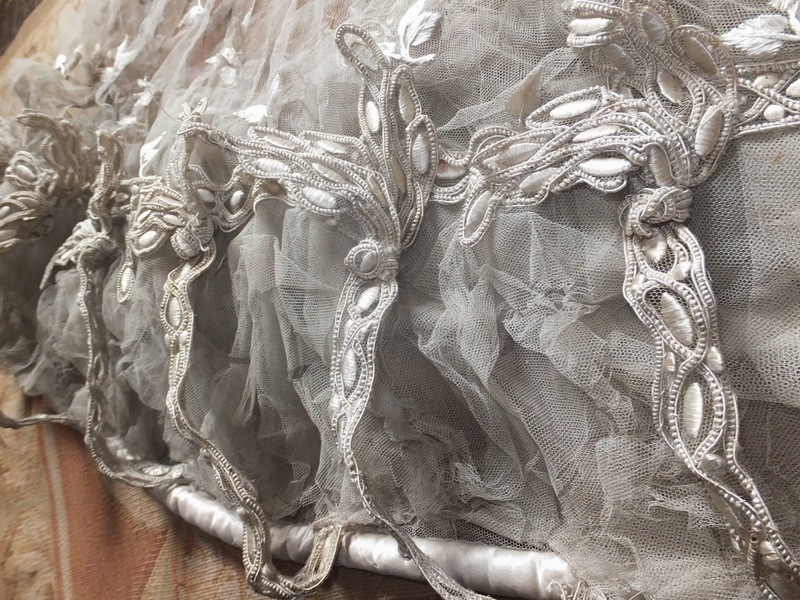 I am offering it for someone with suitable skill and experience to completely re-make it, using the fabulous decorations with new fabric or netting. For this reason I am keeping the dress exactly as it is, so that you can copy it. 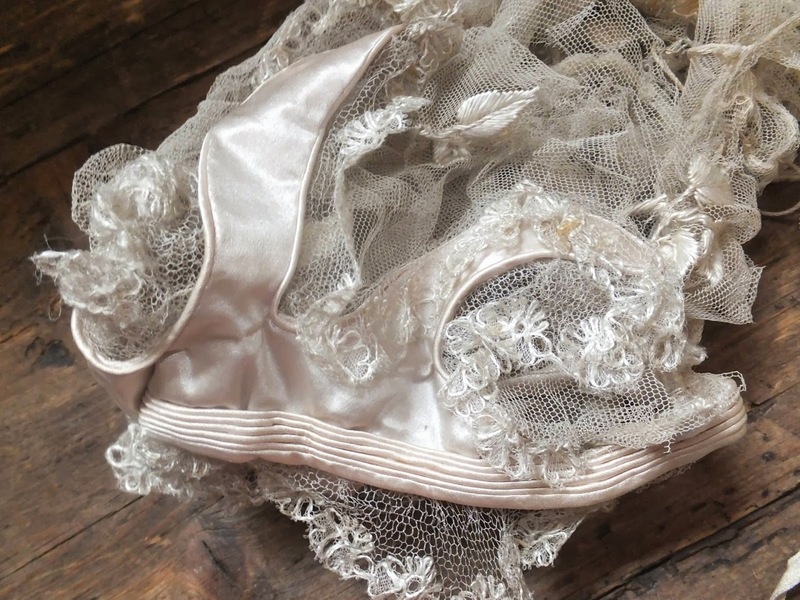 Despite the netting being completely full of two hundred years of dark dust, and completely shattered, it is still in the original shape and even features such as the silk ties for the draw high waist are still in good condition. I think it will be possible to make a very close copy, using the shape as a pattern for cutting your new fabric. 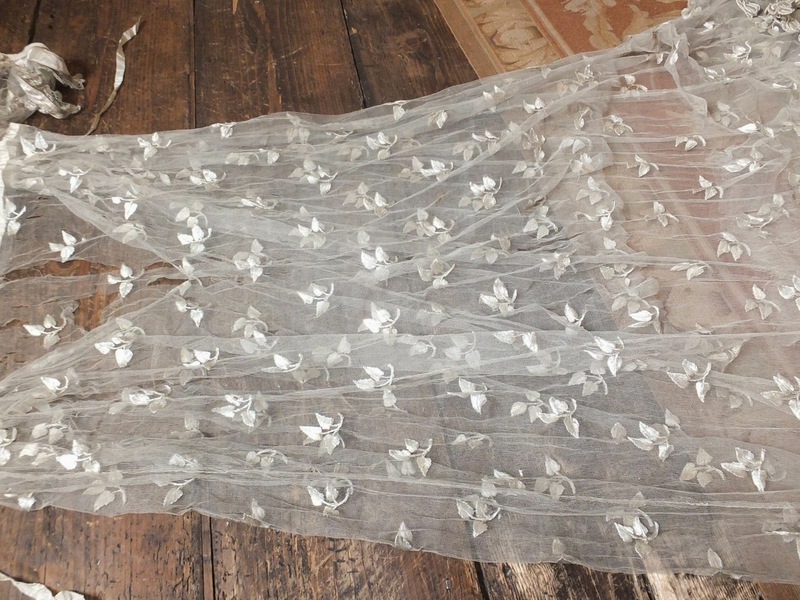 Sadly, you may not be able to use the wonderful silk embroidered leaves all over the net. These leaf embroideries are so fresh, but it would require endless and daunting patience to cut them out and re-apply them. But you will want to keep at least some of them! The dress dates to circa 1822-3 and you can see similar [but not so elaborate!] 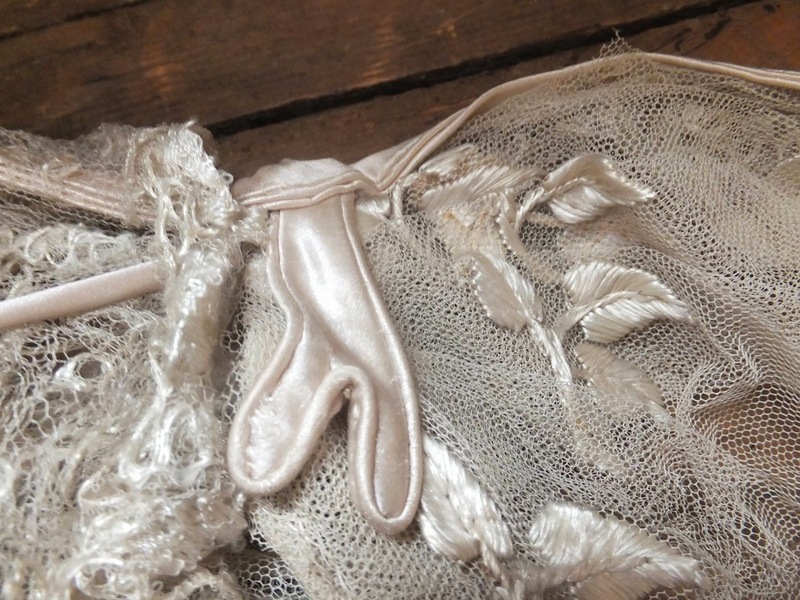 on page 119/120 of Nancy Bradfields ' Costume in Detail, 1730-1930. Also pages 182/183 of the Kyoto Institute's 'Fashion; A History from the 18th to the 20th Century Volume 1. The low boat shaped neck has piping and satin lozenge shaped motifs all along the edge. 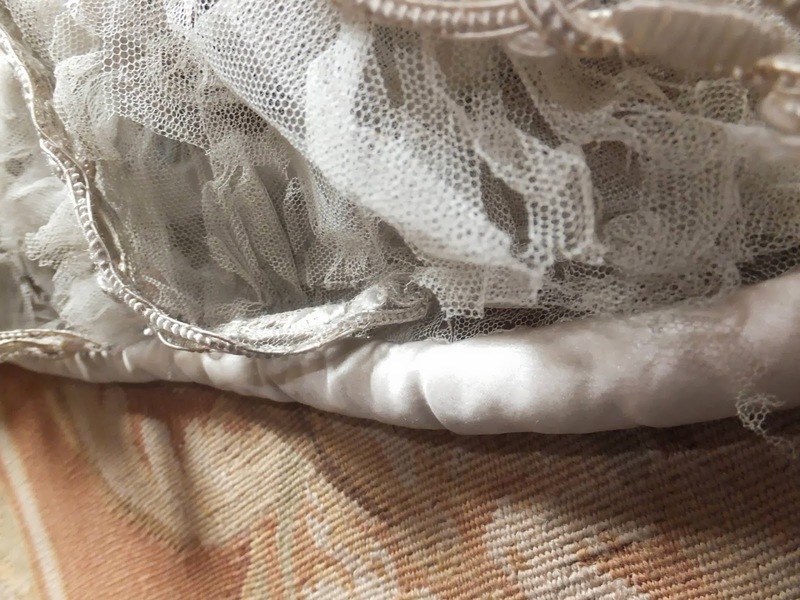 The sleeves, of large puffs, have superb lozenges edged in Blonde lace and bordered with silk piping, so that the netting would push in-between the satin to make the puffs. 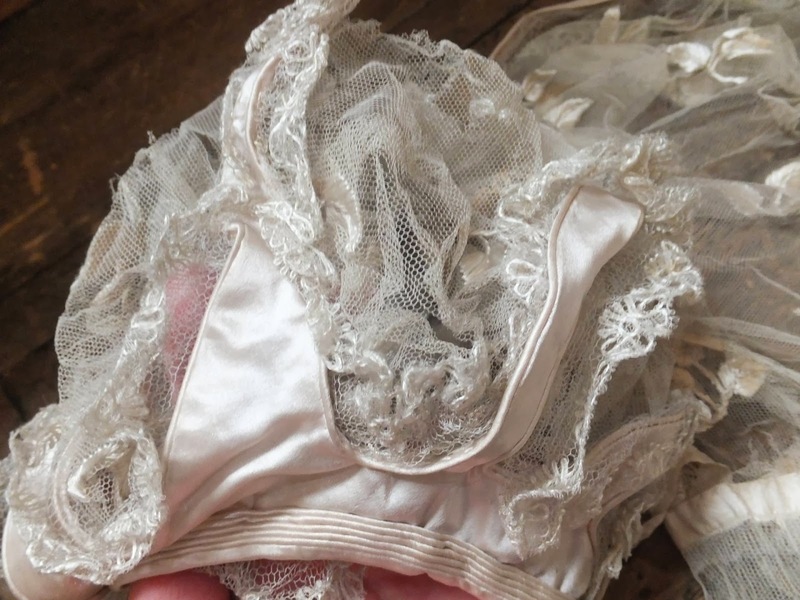 The high waist has the original tiny silk band to attach the bodice to the skirt, and the back bodice has the original ties. 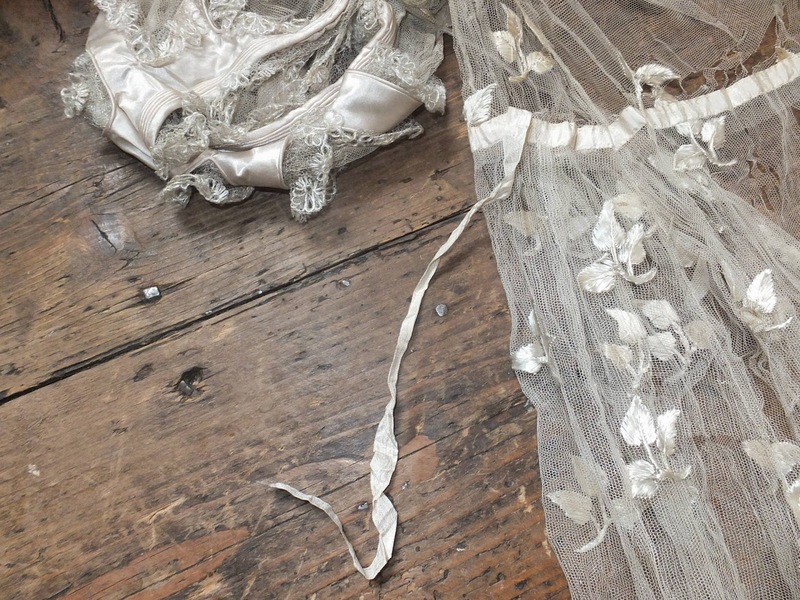 But it is the deep, deep hem line that takes our breath away! The netting here is vigerously ruched and the lozenge shapes rise lover the netting to create almost a hem tiara! Below this exciting decoration is the rounded and padded hem in lovely condition. So, how do the decorations stand out as they do? Well, it is a sight to behold! 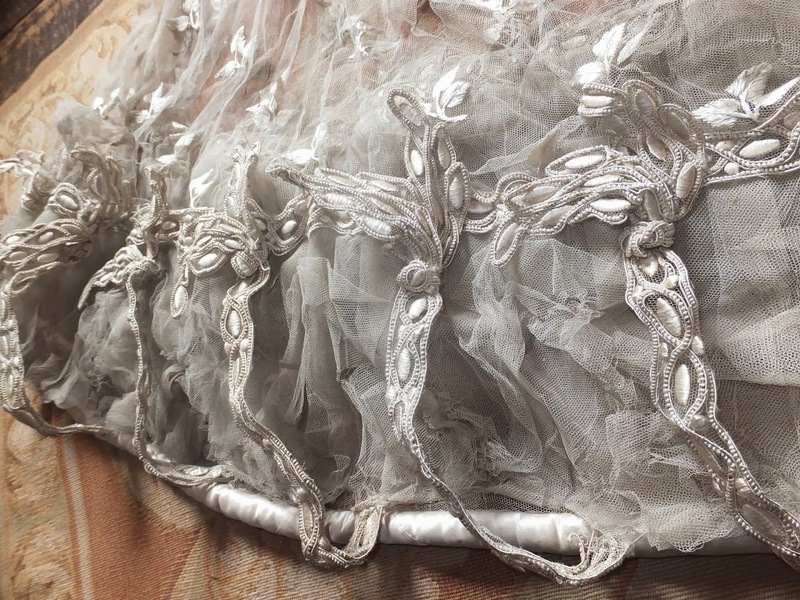 All of it is wired, very fine wire all covered in white thread so that it is hidden behind the satin. 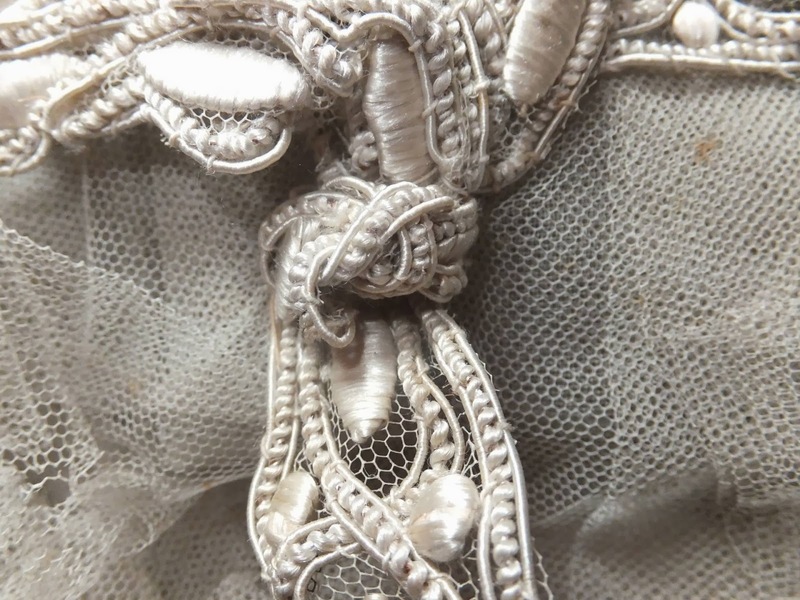 And when we straighten out each motif, we find that each lozenge has a net underlayer which somehow seems to have survived, perhaps because it has been protected by the wire structure. And then, within the motif, is a beautiful & perfect knot, so lovely! It is amazing that all of this decoration, apart from a slight stain here and there, is in beautiful condition, and waiting for you to reuse it! A challenging but so very worthwhile task and a rare opportunity. Please don't use a sewing machine - you will completely de-value these fine decortions! Please do take a look in my shop if you have the time! We do not rip apart 200 year old dresses for parts!!!!!!!!!!! Seriously, despite the shattered condition, there are museums that would *love* it as it just because of the history. 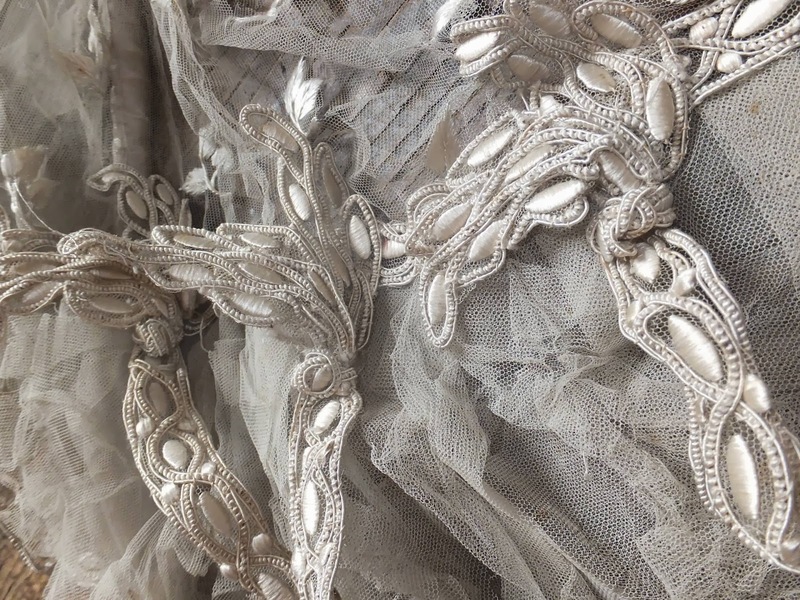 And, of course, this would have been over some sort of silk underdress - although possibly sleeveless. Unfortunately its ended up in a place where it will likely end up in bits and parts for "study" by a non professional. 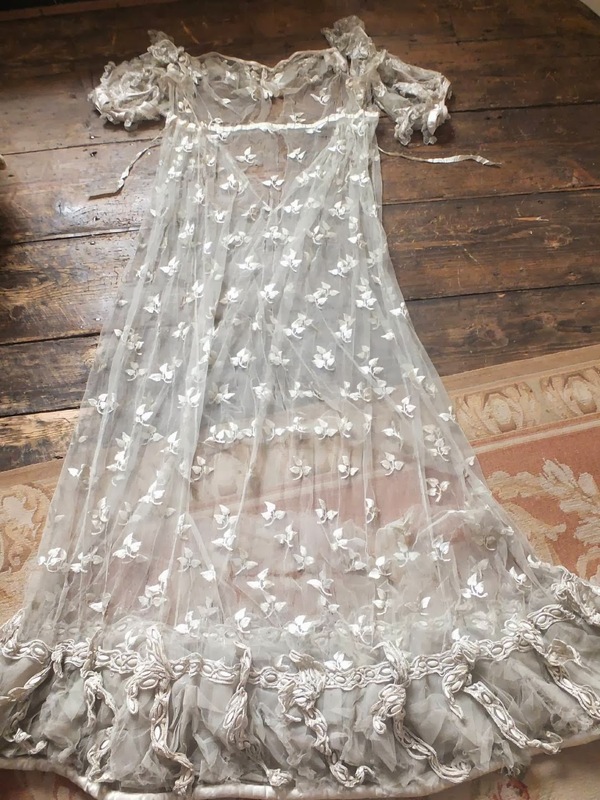 Its a shame that it has not ended up in a museum or a place where it can be professionally restored to its previous stunning beauty, like when it just stepped out of the dress maker. Alas it has not, i know who bought it. Lets all give a little prayer for the passing of this beauty. 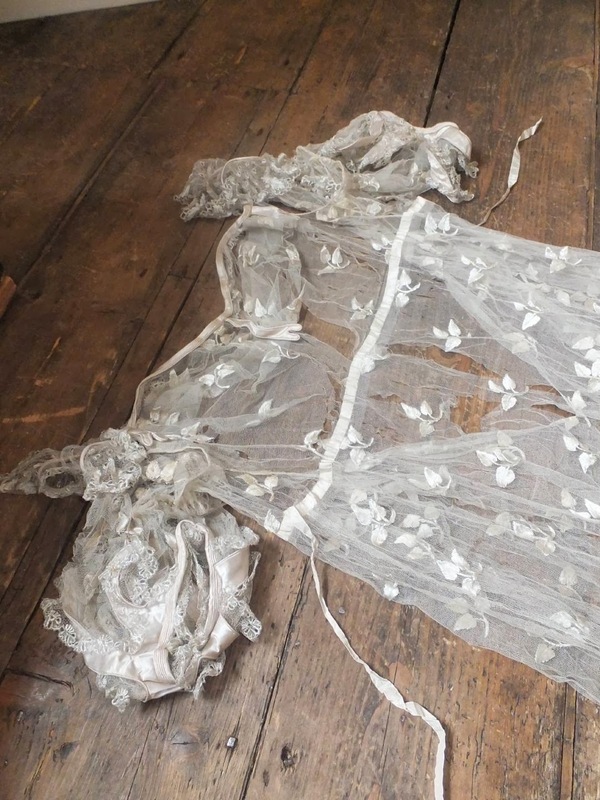 As much as I dislike people that rip up artwork like this, it does go to show what this website is for - to preserve these garments in some way so we can still study them even though they no longer exist. I hate the thought of something like this being taken apart and reused. Take it apart to make a pattern ... ok, *maybe*. But it looks so fragile I wouldn't want to do that. There is a lot that can be learned from an old piece like this even if it is in sad condition. Sounds like it was used for scrap. I know I've saved a few pieces from that fate back when ebay showed who had the highest bid. You've got to wonder if these same people would knock down a 200 year old house to build a mega mansion rather than try to fix the old place up.